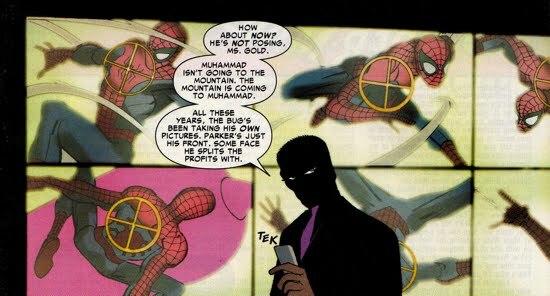 The Brand New Day storyline brought about numerous changes to the Spiderverse, some of which drastically altered the perspective of Norman Osborn. These changes included the introduction of new supporting characters as well as bringing back a character who was previously thought dead. 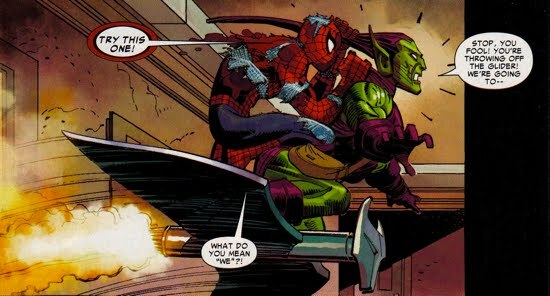 The entire scope of these changes brought about will not be discussed on this site, because I will only focus on the changes that affect Norman Osborn. 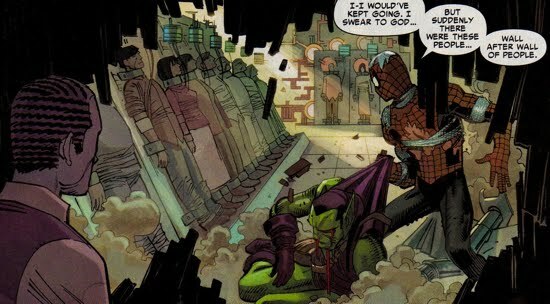 In the Brand New Day Spiderverse, Harry Osborn is still alive having had been in Europe all the years he was believed to be dead. The second major change which affects Norman Osborn (and technically every character in the Marvel Universe) is that everyone has somehow "forgotten" that Peter Parker is Spider-Man. 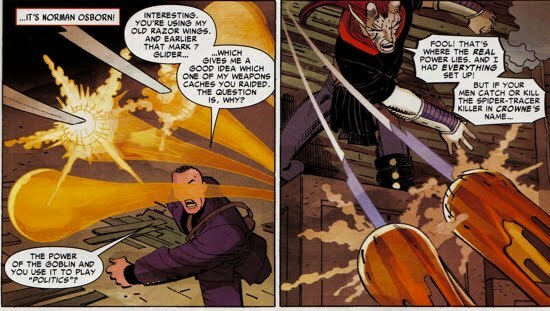 The mechanism for how this amnesiac spell came about was explained in 2010's OMIT storyline. The result was a clean slate between Norman and Peter and their first conflict with each other in the post-Brand New Day universe is featured in Amazing Spider-Man #568-573 in a story arc entitled New Ways to Die. In the first installment, Amazing Spider-Man #568, the New York City mayoral race is in full swing and there is trouble on the horizon for candidate Randall Crowne, who is slipping in the polls. This drop is largely due to Menace having had exposed a sweat shop that was linked to Crowne. 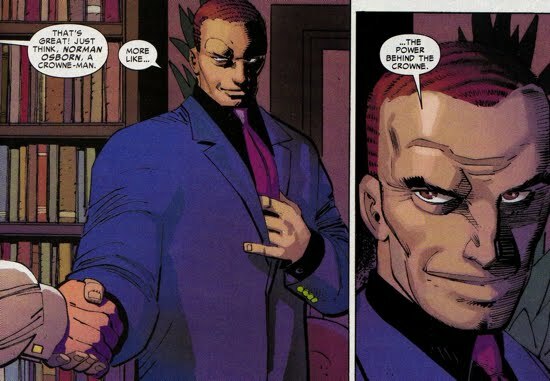 So Crowne solicits help of his “old friend” Norman Osborn. He wants Norman to back him, because Norman has such tremendous PR currently. Norman agrees as long as Crowne gets his “outfit” a “hunting permit.” So the Thunderbolts are going to New York City to catch Spider-Man, the obvious suspect behind the ongoing “Spider Tracer Killings.” An ongoing plot line in the Brand New Day saga is that dead bodies have been found with Spider Tracers on/near them, making Spider-Man a very obvious murder suspect. Not to mention he is an unregistered hero at large as well, making Spider-Man desired by the authorities for that crime as well. 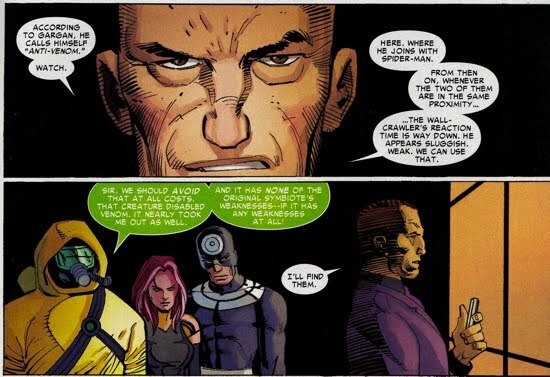 Crowne hopes that solving the Spider Tracer murders will earn him a positive swing in the polls, and the Thunderbolts are good set of individuals capable of pulling that off. Also, Eddie Brock has checked into the F.E.A.S.T. center, a shelter where Aunt May now volunteers. 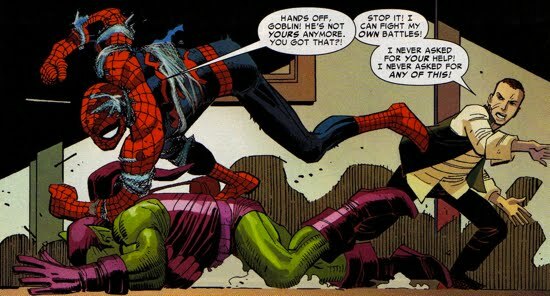 Peter is met by security guards when he arrives back at his apartment, to find none other than Norman Osborn sitting in his living room waiting for him. Another interesting tidbit mentioned in this story occurs when Randall Crowne comments on how Norman “already has access to his [Crowne’s] secret resources.” What exactly does that entail? Amazing Spider-Man #569 picks up immediately following the events of the previous issue where Norman and some of the Thunderbolts are waiting in Peter’s apartment. 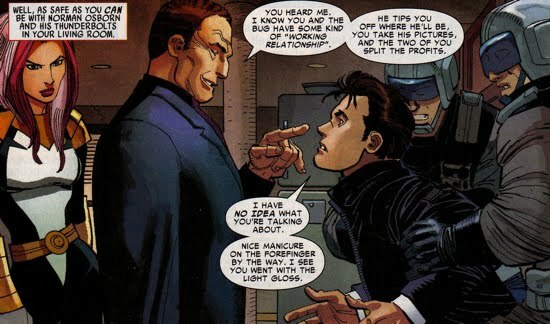 Norman wants information on Spider-Man and he knows Peter has a “working relationship with him”. Norman tells Peter to relay a message to Spider-Man, “there’s a new sheriff in town”. After trashing Peter’s apartment, they leave, and Norman is awarded the Crowne Foundation’s Man of the Year award. 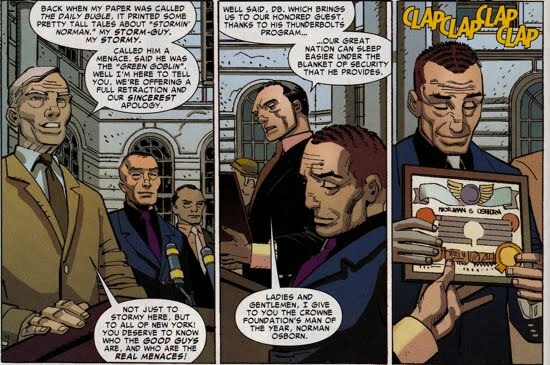 At the same ceremony, Dexter Bennett retracts the prior publications of the Daily Bugle that suggest Norman Osborn and the Green Goblin are one in the same. That prompts Ben Urich to make a humorous comment about magic at this point (this being a shot at the Brand New Day world). Norman then visits Harry’s restaurant, the Coffee Bean, and insults him for leaving behind the family business to pursue serving drinks to people. Back at Osborn Manor on Columbus Circle, where Norman has had a makeshift Thunderbolts headquarters assembled, Spider-Man breaks in to deliver a message to Norman. He says that he knows he’s the Goblin and he knows all of his secrets. 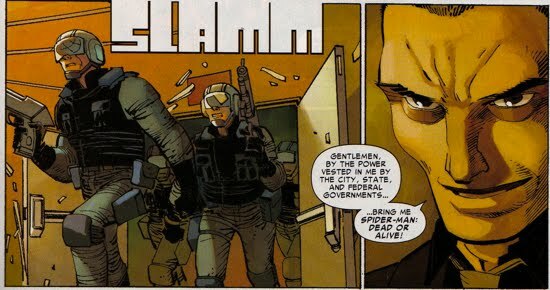 After Spider-Man leaves, Norman claims that Spider-Man has just caused more trouble for himself by assaulting federal officers. At the very conclusion, Anti-Venom, the new Eddie Brock/symbiote combo is created. Venom and Anti-Venom collide at the F.E.A.S.T. center as Spider-Man hurries there to protect Aunt May at the beginning of Amazing Spider-Man #570. Norman pursues Spider-Man in the Thunderbolt’s aircraft the Zeus, coordinating the Thunderbolts in the process. Interestingly, while Norman is speaking with Crowne on the phone, it sounds like he has some pretty bad things he’s going to do to Spider-Man when he catches him, fancy that! Menace then attacks Bill Hollister in his office and also confronts Norman, who is atop a building observing the Venom/Anti-Venom/Spider-Man ruckus occurring on the streets below. Anti-Venom appears to “purify” Mac Gargan of the Venom symbiote. Continuing from the previous issue, Amazing Spider-Man #571 begins as Menace warns Norman that he [Menace] has plans for the city and they do not involve Norman. Therefore, Menace wants Norman out of the picture. Norman refuses (of course), so Menace attacks him and seems to be winning the fight, but Norman gives a self destruct code for the glider Menace is flying (Norman knows b/c its his equipment). Norman is also able to realize which hideout Menace has raided to get this stuff. Norman then tells Menace that he doesn’t care about the mayoral race, only about getting Spider-Man. Menace immediately feels that Norman is not worth his time then. As Menace speeds off, Norman sees a camera that has been planted there to take pictures of Spider-Man. Meanwhile, the Thunderbolts are fighting Anti-Venom and in the process, Radioactive Man has been badly injured. Norman calls the Thunderbolts off and briefs them back at the headquarters. Norman has identified the frequency of the signal that the Spider emblem on Spidey’s costume signals to his camera, allowing for excellent picture taking capabilities while in battle. Norman now knows how to find Spider-Man and kill him. Harry hands over an Oscorp file to Ben Urich and Sally Floyd that may contain information linking financial transactions between Crowne and his father. In Amazing Spider-Man #572, Norman has just briefed the Thunderbolts regarding his attack strategy on Spider-Man. That is, following the link between Peter’s camera and the Spider emblem on his chest. It appears that Anti-Venom has infiltrated the Thunderbolts guards and he's disguised himself as one of them. Anti-Venom then steals Peter’s camera back from Osborn's possession. Norman then extracts the Anti-Venom residue from Gargan’s body and subjects Freak to it. Freak cannot die, everytime he “dies” his body removes the weakness that killed him. Norman knows this and uses Freak to generate a Super-Venom to use against Anti-Venom. An Oscorp truck picked up Freak at the end of Amazing Spider-Man #558. Norman also expounds his theory on what Anti-Venom is, a conglomerate of human/alien antibodies, with remarkable regenerative properties. Bullseye is sent out after Spider-Man, but Anti-Venom helps Spider-Man in evading Bullseye and the guards. 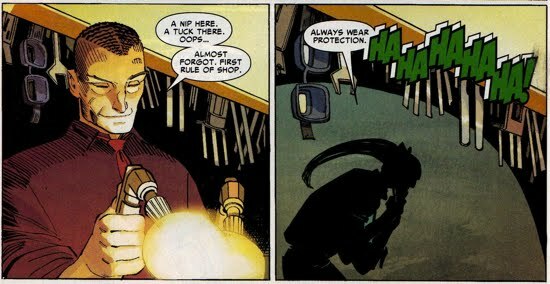 He returns Spider-Man's camera to him and explains how Osborn was going to attack him. During Bullseye's attack on Spider-Man, Harry’s restaurant, the Coffee Bean, was destroyed in the process. 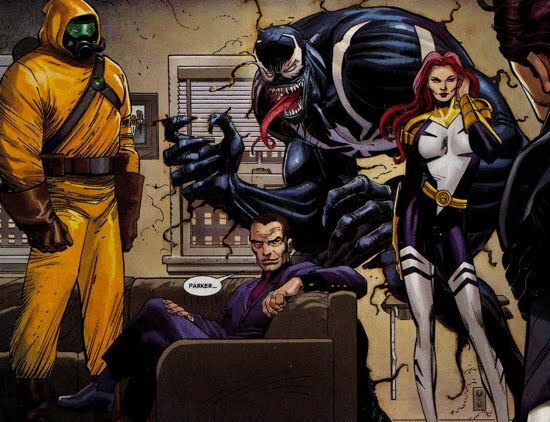 Norman, now fully dressed as the Goblin, assembles the Thunderbolts, administers the anti-Anti-Venom serum to Gargan and places him in his old Scorpion costume to deliver the toxin to Anti-Venom using his Scorpion tail. The final chapter of this story arc is featured in Amazing Spider-Man #573. This issue begins with Harry going to confront his father at his New Jersey office. Interestingly, this office was built because of the clear view of the George Washington bridge, I wonder why that is? When Harry arrives, Norman is waiting for Harry in his Goblin attire. Norman tells Harry he did him a favor destroying the Coffee Bean and that his place is by his father’s side at Oscorp. Norman also says that he has been recording Harry’s therapy sessions over the years and he is aware of all of Harry's complaining about how "[his] father never had time for [him]. He was too busy fighting Spider-Man". Norman then tells Harry that none of "this" has anything to do with Spider-Man, rather with Harry and his…Everything Norman is referring to hear is shrouded in secrecy because he quickly gets a message stating that Spider-Man is on his way to Norman's headquarters. To date, what exactly "this" was referring to is unknown. Meanwhile, Spider-Man and Anti-Venom are coming after Osborn at this facility. 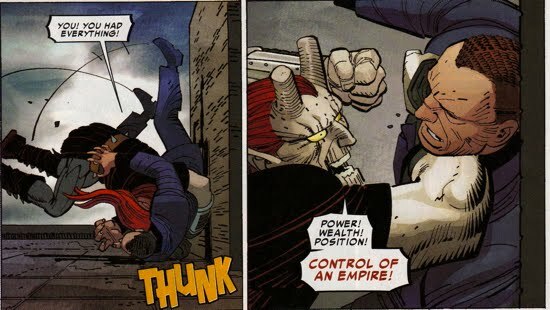 At that moment, Gargan and Brock are battling it out as Gargan uses the serum to destroy Brock’s Anti-Venom capabilities. We see at the end of the story that Brock doesn’t lose them fully though. Spider-Man attacks Norman and beats him mercilessly sending him through wall after wall in the building until they come upon a holding facility for experiments run using humans as guinea pigs. Norman tells Peter this is not his doing, but that these “Promethean Trials” are Harry’s handiwork. 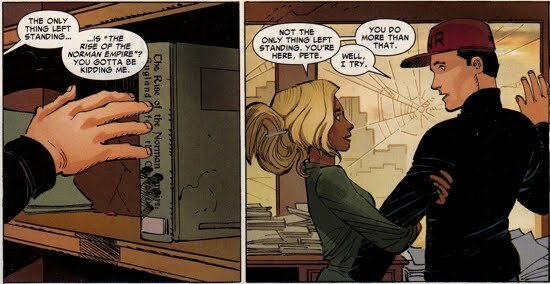 Harry neither confirms nor denies this allegation, although we later learn in Amazing Spider-Man #582 that what Norman says is true. Norman than activates a self destruct code for the building and Spider-Man has to decide whether or not to worry about Norman, or the human guinea pigs trapped in the building. Songbird, Spidey, and Radioactive Man save the people and Songbird lets Spider-Man go freely not turning him over to Osborn. At an outdoors press conference Norman states that the Tracer-Killer was dealt a “crushing blow” and that he will not be active any more in the city, treating it as a victory. 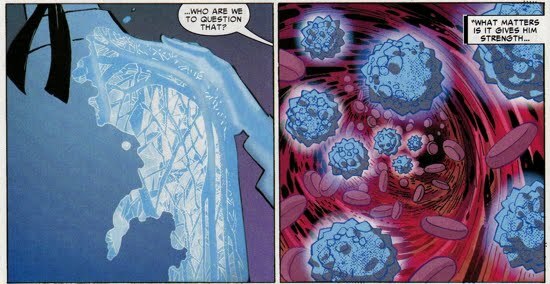 He also slams Spider-Man for destroying his New Jersey research facility, claiming that Spider-Man has hindered their capabilities of curing diseases. Norman states to Ben Urich that any of the “unorthodox medical trials…experiments on humans” may best be answered by his son, Harry, who may have information from when he was running the company. Back at Oscorp, Harry, Peter and Lily are digging through the mess to find files that may help clear Harry’s name. Lily kisses Peter when Harry isn’t around, and as Harry leaves you can see a capsule that says Oscorp Prometheus X-90 in his bag.